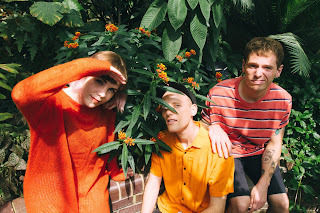 If It's Too Loud...: Doe - "Heated"
It's been a couple of years since we heard new music from London's Doe, but we currently have a new single, "Heated." The new song keeps up the heavily 90's influenced sound that made us adore Doe in 2016. It still has the classic loud/quiet/loud set up with verses just barely above a whisper and a loud, clanging chorus. But there is something smoother with "Heated." It has a more mature and less bratty sound. Doe has definitely grown as a band and this song is a huge step forward. Instead of a punk song, they have released a single that is just shy of being an anthem. It still has guitars that don't sound quite right and parts that stumble around, but that's part of the charm of indie rock. You can watch the video for "Heated" below. Grow Into It, the new album from Doe, will be out September 28 on Big Scary Monsters in Europe and Topshelf Records in the US. For more on Doe, check them out on Facebook and Twitter.